Setting your shipping and handling fees too high or too low can wreck your ecommerce business model. If you charge too much, your cart abandonment rate can skyrocket. If you charge too little, your profit margins can quickly disappear. For most online merchants, cost of goods sold and operating costs are fairly easy to capture. But shipping and fulfillment costs are sometimes difficult to determine, by comparison. One way to handle this problem is to reduce the complexity of shipping and handling to a single spreadsheet that captures everything you need to know. First, gather the facts about your current shipping costs. Determine current shipping rates. To begin, you will need (a) the current USPS rate chart for USPS shipments, (b) the UPS daily pick-up rate chart if you have a UPS or FedEx contract, or (c ) the UPS retail rate chart if you drop off your parcels at a UPS or FedEx store. Note that the published daily pick-up UPS and FedEx base rates and surcharge rates are the same. There are some minor differences in the retail rates (sometimes called counter rates) that are charged by UPS stores and FedEx Kinkos. Determine surcharge rates. These are typically the USPS delivery confirmation fees, UPS and FedEx residential and delivery area surcharges and the UPS and FedEx fuel surcharge. Estimate surcharge volume. This is the percentage of your UPS and FedEx parcels that are subject to the residential surcharge and to the delivery area surcharge. You will also need to estimate the percentage of your USPS parcels that include the delivery confirmation option. Determine your per-order warehouse and supplies expense. To do this, add your monthly warehouse labor cost, shipping supplies expense, and facility cost (excluding USPS, UPS or FedEx delivery costs) and divide this by your average monthly shipping volume. For example, if your total warehouse and supplies is $4,250 per month and you ship 1,000 orders per month, the per order cost equals $4.25. Then, calculate your average, per-order shipping and handling costs. 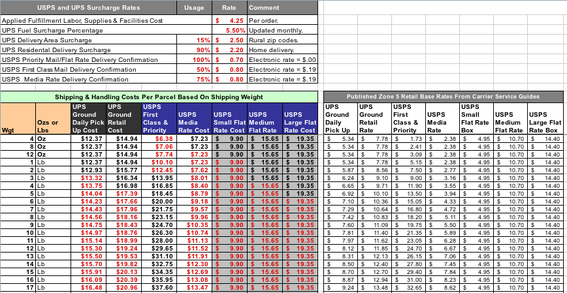 The example spreadsheet, below, includes current USPS and UPS base rates and surcharges rates, all based on shipping weights. I have assumed $4.25 per order for warehouse and supplies expense and have entered a starting set of surcharge usage factors, such as 90 percent of all UPS parcels are subject to the residential delivery surcharge. When a rate calls for a zone designation, I have used Zone 5, which is about the average amount compared to the entire Zone 2 to Zone 8 cost range. You can easily change these assumptions to match the facts of your unique shipping and handling situation. Screen capture, Shipping and Handling spreadsheet, partial view. With this simple model, you can project your actual shipping and handling cost for each package weight as well as rate-shop between carriers and delivery methods. For example, based on these assumptions, USPS Priority Mail is the lower-cost choice for a 2-pound parcel, but UPS is the lower-cost solution for a 5-pound package. But, changes in surcharge fees or your mix of surcharge usage rates can have a big impact on relative costs. Next, compare your individual sales totals to their corresponding shipping and handling costs. Since you now know your shipping and handling costs by package weight, simply compare a representative sample of your per-order sales totals to their individual package weights and associated real shipping and handling costs. For example, if the sale was $93.00 (excluding shipping, handling, and taxes) and the shipment was a 4-pound parcel sent via UPS Ground daily pick up rate, you can see from the example spreadsheet that the projected shipping and handling cost would be $13.75 or about 15 percent of net revenue. You can use this method to quickly create a summary of your typical sale totals and associated ship weights and costs. From this, you can develop your unique shipping and handling fee strategy including the potential for free delivery and with confidence that your order fulfillment fee structure is based on facts. You can use the same system to compare your in-house order fulfillment costs with outsourced fulfillment quotations. Setting your online shipping and handling fees too high or too low can be a serious mistake. But, it really isn’t that difficult to create a shipping-and-handling cost model based on package shipping weights, and to then link order sales totals to their corresponding shipping and handling costs. This is a simple way to ensure your shipping and handling fees are based on facts, and not just guesses.